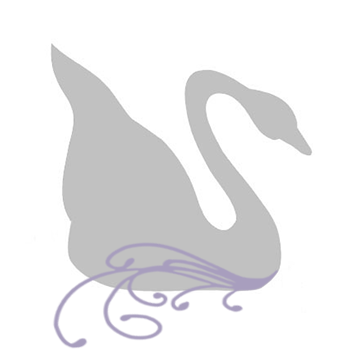 I regularly visit fellow beaders' blogs' and one day, I happened acrossed Katie Hacker's Blog. She had done a post on Bead Stoppers and I left a comment. A week or so later she contacted me to tell me I had won some bead stoppers! I was so excited, I never win anything. Really. Never. When I first started out beading I had not heard of Bead Stoppers yet...and if you bead, as you can imagine, it was quite frustrating losing all the beads I had just strung from the end of the wire. 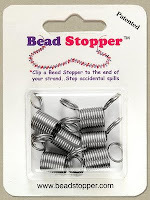 When I discovered Bead Stoppers, I purchased at least four packages and I've used them all. So much so that I was actually in need of more -and then I won some from Katie's blog! Whew! I received them by mail this past friday and I was in such need of them, I have used all them already in temporary designs. The package even came with some cute smaller bead stoppers. Congrats on the win! Bead stoppers are so wonderful - I used to use painter's tape at my workshops etc. That wasn't very good as they were hard to remove and sometimes unreliable.